Apologies can be very difficult, but it's the best solution to keep relationships and encounters from getting out of hand. What I don't like is when someone expects me to apologize for something I either haven't done or something that I felt was the right thing to do. Its hard sometimes to swallow your pride and admit you were wrong, but it can also be really cleansing to just admit it! Honestly I don't understand what the fuss is about with people. I mean, you don't think about it when you commit a mistake so why think so much when you've got to apologize, right? As for me, I have absolutely no trouble saying sorry. In fact I think I have the other kind of problem where I sometimes say sorry when it's not even my fault! Apologizing is the best thing to do when you are in the wrong. It's cathartic. Great post. 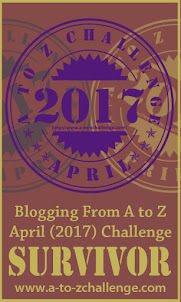 Visiting from the A to Z Challenge. Cheers! Yes. If I know that I have hurt someone​, I do apologize quickly. Would be good if the person says frankly what hurt them, coz it's not clear at times, and if it is, can try not to go there again. nice post! I have come across people who find it equally difficult to apologize and to forgive. I don't understand why it's like that for them. Apologising is an art. I know kids who can apologise and forgive instantly. As we grow up, ego comes into play. Then it becomes a question of 'loss of face' when in fact, it should just be as simple as 'Hey I'm sorry I acted like a jerk'. But no, that doesn't happen as often as we'd like. Absolutely Shailaja, ego is what stops us from apologizing or forgiving someone. Kids are amazing that ways, we, grown ups, should reverse learn something from them each day. All the best with your AtoZ challenge too. Why does apologising become so much harder as we get older? Why does it seem imbued with so much more ego? I notice it in my kids especially. They're so much more reluctant to apologise now as teens than they were when they were smaller. So true! Interesting that it's so hard for people to do it. I often wonder if it's because we are forced to apologize so often as children? Makes us buck up as adults and not want to as an inner rebellion. Well said! 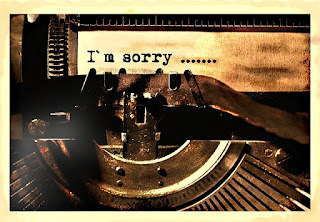 Uttering the word 'Sorry' may seem simple, but it takes a great deal to swallow your pride and admit to your mistake. Looking forward to more posts. Day-dreamer, occasional writer, guitar hobbyist and dog lover. Look at the progress you make on this Girl! Let's rock it.